There are many ways to invite problems when you lay ceramic tile. Avoid such problems and a tile floor can last for decades—crack-free. Ignore these problems and your floor tiles and grout lines can begin cracking shortly after the job is complete. Here are nine pro tips to bear in mind when performing installation. Tile grades 1 and 2 are recommended for floors or walls. Grade 3 tiles are too thin and likely to crack with traffic. Use grade 3 tiles for walls only. Tile is typically set in thinset mortar over cement board, which in turn has been set on 3/4″ plywood. If the cement board was not set in thinset mortar, or if the plywood was the wrong grade, you may have a problem. Movement between the plywood and cement board can cause cracking. Similarly, compression due to voids in CDX plywood can also cause movement and cracking. The addition of polymer to thinset mortar greatly increases strength and bond, with minimal shrinkage, which reduces the chance of cracks forming. Cement board seams should be taped for the best results. Embed an alkali-resistant fiberglass mesh tape in thinset over all seams. Press tape into thinset with a trowel, then spread more thinset over the tape. Spread thinset over screw depressions as well. Allow thinset to cure according to the manufacturer’s directions. Walls can move slightly with changes in temperature. If you filled the joint between the wall and the last row of tiles, the wall may push against the tiles and cause cracking, typically in the middle of the floor. A floor may not be stiff enough for ceramic tile. For example, the joists may span too long, or the spacing between joists may be 24″ on center instead of 16″. A subfloor of inadequate thickness (and the added weight of the tile) can result in a “spongy” floor, not to mention cracked tiles and grout lines. 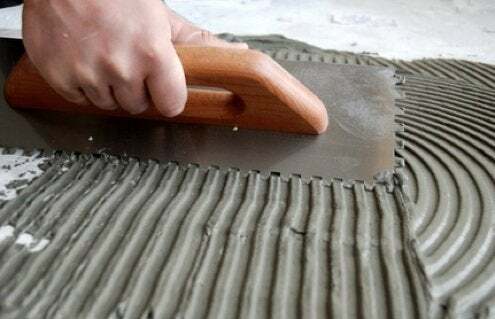 Thinset coverage depends upon using the recommended trowel notching, wielding the trowel at the correct angle, and making sure the thinset doesn’t dry before being covered with tile. Recommended wait times range from 48 to 72 hours. If it’s imperative that you get back into your kitchen, stepping on plywood sheets to disperse your weight over a greater area is an option, but check with your tile contractor first. Cracks in tile floors may be symptomatic of far bigger problems. If your home’s foundation is built upon weak soil or expansive soils, you may have your answer. Weak soil results in uneven foundation settlement and leads to cracking floors and walls. If your neighborhood is known to have expansive clay soils, soil pressure may be causing foundation walls to bow while putting pressure on floors. Floor Tile: Which Is Best for Your Bath?